Home Exabytes Tips Sharing Which Is The Best Website Builder? When we talk about how to build a website, these 3 website builders usually come to our mind: Wix, Weebly and Squarespace. Three of them provide rich publishing features and website design tools. Because of the similarity of features offered by three of them, many users are having a hard time choosing the one that best suits them. Moreover, their constant updates on design options and features make it harder for potential users to choose. In this article, you will find out all you need to know in terms of their differences, and decide which one best suits your needs. Wix has the easier editor for a beginner. It features a complete drag and drop editor, handy navigation and on point guidance. Wix allows its users absolute positioning experience, where they get to place their content, widgets and elements literally anywhere they like. However, Wix does not allow users to change template after they choose. Users will need to create a new one and rearrange their content. Weebly does offer drag and drop. But it does not really provide absolute positioning like Wix does. Users are only allowed to place their content, widgets and elements in the template fixed area. However, Weebly lets users change their template in the future without losing their content. Squarespace editor is somewhat complicated. It does not truly offer “what you see is what you get” editing. Even it’s had made a major change on this but still it doesn’t work that well compared to Wix and Weebly. 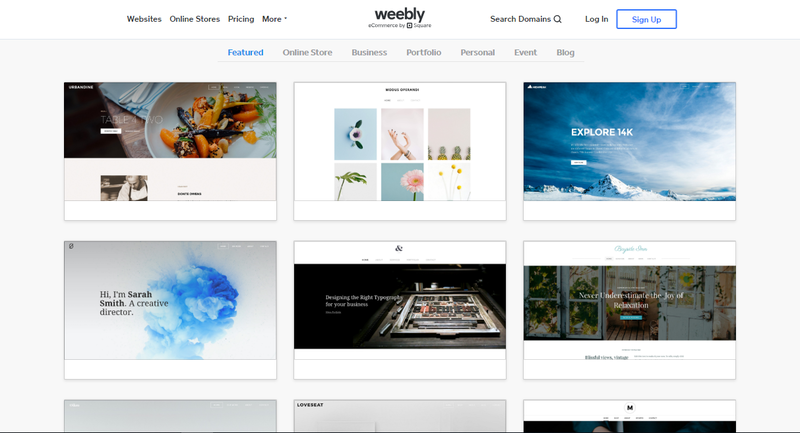 Weebly has a smaller gallery and collection yet still beautiful. All new templates are responsive by default but users can’t change the mobile view of their site. Despite that, Weebly is the only one that allows users to edit HTML/CSS directly. Wix offers huge collections of stunning and trendy design, with plenty of fancy templates for users to choose from. Users are also able to change their website mobile interface through Wix mobile editor without affecting desktop interface. With all these best features and huge collection of templates, Wix does not allow HTML/CSS customisation, which might be limiting to users who know coding or have experience in website creation. Squarespace is all about design. It comes with various sets of templates that are created uniquely with photography and colour scheme. If you do not have good imagery to replace the template imagery, your site will only be average good. Also, all of their templates come with mobile interface (although non-editable). Wix also looks great because of its SEO tools. The interface of setting is very convenient and user-friendly. Each box comes with short descriptions about the data that should be filled. It is not complicated for people who don’t understand much about SEO. Wix also allows you to set parameters for each page in “pages category”, which includes title, descriptions, keywords and human friendly URL. Weebly also offers traditional SEO toolkit, Google analytics code and real time site statistics just like Wix does. In addition, it provides easy-to-use guide to help users to optimize their websites for search engines. It’s not difficult — just put in your title, descriptions and keywords for the page. If you’re looking for organic traffic for your website, Weebly should be your first choice because of the versatility it offers. Squarespace has a very advanced SEO toolkit just like Weebly does. It produces pages with HTML markup which is search engine friendly. Also, it allows users to write human readable URLs. However, there is one thing that might potentially confuse users who have experience in SEO — the Alt-text is called ‘file name’. It is very important information for users to describe their photos in the website. Wix offers email support and phone support during business hours apart from email ticketing system and customer forums. It also provides many video tutorials and how to articles. Besides, almost all of the control panel embody of pop-up guidance. Weebly also offers live chat support, phone support, email ticketing system and open community forum. The company is active on social media, and provides guidance for beginners in help centers but nothing much compared to Wix. Squarespace unfortunately does not offer phone call support. However, they do have live chat support, Email support, help center and community forums. Squarespace did hold one-on-one workshops in New York, but it is closed for the time being. The very first you need to bear in mind is that both Wix and Weebly are the well-known free website builders but not Squarespace. Wix plans focus on a wide range of features for different pricing. Prices range from $7 per month to $30 per month. These prices are for monthly plans. Things get different when you sign up for the annual plan. You’ll get a free domain name for 1 year and discounts from 18% to 43% if you sign up for 1 year or 2 years. Weebly prices are based on technical and eCommerce features. Prices start from $14 per month to $46 per month. For annual plans, you’ll get somewhere around 11% to 40% discounts if you sign up for 1 year or 2 years. Just like Wix, Weebly also offers a free domain name for 1 year. Squarespace prices are set by the numbers of pages and extras. They do include advanced features in all plans but you’re only allowed 20 pages for personal plan for $12 per month. Unlimited for business plan is priced at $18 per month. With the price and cap, it is considered fairly expensive. From pricing standpoint, Weebly has better pricing upfront value for starters. Due to the tier and structure system, their pricing are very different. While Squarespace is very competitive on their top tier to Weebly because SSL Certificates and advanced features are included. Bonus Tips: Exabytes offers website builder plans that are powered by Weebly. The four plans offered by Exabytes range from $4.99 per month (the lowest) to $28.99 per month (the highest). Which is the best website builder? It is difficult to tell which is the best website builder. Each of them has its pros and cons, in addition to different target audience. Wix and Weebly are suitable for beginners who prefer to make a website in the shortest time with lower investment possible. Squarespace is the first choice for established businesses that looking for elegant design to create their business websites. Wix focuses on 100% DIY. Users are able to design according to their needs. It’s also for beginners who prefer templates, and do not have any technical knowledge. Weebly focuses on solid functionality, user experience and balance of all. However, Weebly templates are not as beautiful as Wix. .
Squarespace mainly focuses on design and developer tools. However, it relies on user generated photography. Exabytes who offers website builder plans powered by Weebly, on the other hand, focuses on audiences who prefer convenience where they can get web hosting and domain names from Exabytes together with a website builder plan. Make your own website easily with this plan. Moreover, the 100-Day full money-back guarantee gives tremendous trust and total peace of mind to customers in terms of services and the quality they get. Previous article[Infographic] Why Do You Need SSL in 2018?